The 90-page report, titled “Progress on Drinking Water and Sanitation – 2015 update and MDG”, the result of WHO/UNICEF Joint Monitoring Programme for Water Supply and Sanitation (JMP), which began in 1990. In 2000, the member states of the United Nations signed the Millennium Declaration, which later gave rise to the Millennium Development Goals (MDGs). One of the MDGs was the target challenging the global community to halve, by 2015, the proportion of people without sustainable access to safe drinking water and basic sanitation. 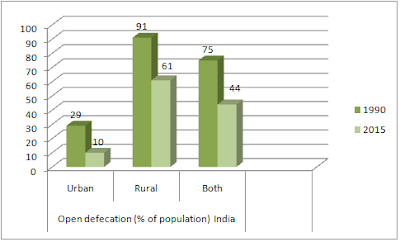 In fact, the report’s data show, India’s 31 per cent reduction in open defecation from 75 per cent in 1990 to 44 in 2015 stands out in sharp contrast to Pakistan, which reduced it from 49 to 13 per cent; Bangladesh, which reduced it from 34 per cent to 1 per cent; and Nepal, which reduced it from 88 to 32 per cent; Sri Lanka, which reduced it from 13 per cent to 0 per cent. 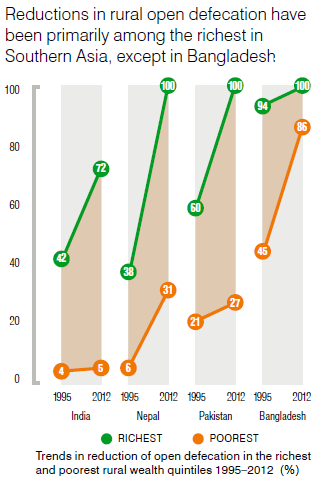 In China, open defecation was just 7 per cent in 1990, which went down to 1 per cent in 2015. The report says that India’s progress towards MDG target – of achieving 50 per cent improvement in sanitation by 2015 – has been “moderate”. In fact, it calculates, between 1990 and 2015, India was able to improve sanitation facilities only by 28 per cent, compared to Pakistan 50 per cent, Nepal 43 per cent, Bangladesh and Sri Lanka 38 per cent, and China 37 per cent. Thus, while Pakistan, Sri Lanka and China have already “met target”, the report says, Bangladesh and Nepal have made “good progress”. 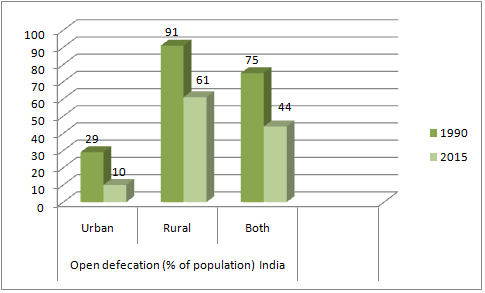 Even as quantifying progress of all countries in the world towards achieving total sanitation goals, the report does not, however, give any explanation why the progress in some countries has been “poor”, “moderate” while in others it is “good.” Nor is there any explanation as to why the poorest sections, for instance, in India, have seen very little progress in achieving sanitation goals.